Spring is here and summer is near. You’ve probably thought about some light spring cleaning: folding up your Winter coats, cleaning out the back of the refrigerator… but what about your car? 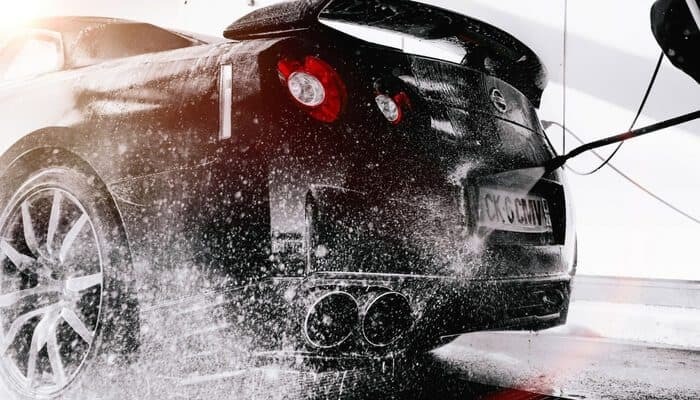 After the Winter’s snow, salt, rain and cold weather it’s easy to skip the car wash… for 4 months. Getting back into car cleaning and maintenance after a seasonal break can be daunting. Lucky for you, we’ve put together a helpful spring cleaning checklist you can use to make sure your car is clean and in top shape for Summer. Take out the trash: It’s easy for your car to fill up with old receipts, fast food wrappers, plastic bottles and before you knonw it: your car is a mini garbage truck. Get a trash bag and empty of all the excess, or make it a game with your kids next time you fill up with gas. Get them to pass trash out the window and see who can give you the most. Keep wipes in the car: I put some wet wipes in my car last year and haven’t looked back. A plastic box of wipes is invaluable for wiping down your dash, cleaning up coffee spills, food mess, kids’ sticky fingers… whatever the heck goes on in that vehicle. If you’re feeling fancy, you can buy wipes specially designed for car interiors, but regular baby wipes usually work just fine. Get a trash box: You don’t need to buy a special car trash can; some people swear by a plastic pitcher or cereal container with a flip-up lid. You can even use a plastic grocery bag, although it won’t look quite as neat. The key is to have a spill-proof container at hand where you can easily stash trash. Buy heavy-duty rubber mats for the front: We’re not talking about those flimsy, clear plastic mats. Get heavy, high-quality mats that have deep grooves to catch mud, leaves, snow, sand – everything that wreaks havoc on your carpeted floor mats. These are also easier when it comes to cleaning your car; you just hose them down and you’re done. Buy organizers for your car: Most car clutter is caused by a lack of places to stow stuff. That’s why you end up with pens in the cup holders and mints in the door pockets. Something as simple as a plastic basket can collect things such as lip gloss and spare change. Parents swear by organizers that hang from seat backs, which can hold toys, snacks, diapers and wipes. Buy an extra bin for the trunk to store things like grocery bags, blankets and emergency gear. Banish bad smells:Even a tidy car can get a musty smell. It doesn’t have to be a pink cupcake hanging from your mirror (although, that’s my air freshener of choice) but an odor eliminator stored under your seat can do the trick. Cleaning the inside? Done. Easy. But as soon as it comes to anything under the hood, it can get intimidating. Read our simple and you’ll be re-training as a mechanic in no time. The amount of air your engine gets is very important to its performance. When your air filter hasn’t been changed in a while it can reduce the amount of air that goes to your engine and you may notice your car feeling sluggish. You should change your filter in the rule of 12: every 12,000 miles or every 12 months – whichever comes first. Changing the air filter can help to improve your car’s acceleration and fuel economy. Anti-freeze, power steering fluid, oil… all of these are used up and worn out over time. To keep your car running well, you need to change these out periodically. Spring cleaning is a perfect excuse to do just that. This will also ensure that fluid levels are ready for Summer when your car will really need special care. Changes in temperature can affect the pressure in your car’s tires. Once the weather changes, be sure to measure the pressure in your tires to make sure that they meet the requirements for your vehicle. Driving on tires with low tire pressure can reduce your gas mileage and pose a hazard to your safety. During winter ice and snow can wear out your wipers. This is especially problematic as spring often means heavy showers and lots of rain in general. Having wiper blades in good condition is a matter of car safety. When it comes to our spring cleaning checklist, this is one item you don’t want to skip. Plus, changing your windshield wipers is relatively easy. Start from the top to the bottom. The opposite of cleaning the outside. A general rule of thumb is to start from the bottom, working your way up. Clean your tires: Use a non-acid based tire cleaner. You can use degreasers on your wheels, just avoid using detergents because they can harm your car’s paint. Clean your glass using an ammonia-free glass cleaner and a microfiber cloth. So now your car is all Spring cleaned and ready for those Summer road trips. Wearing your Wayfarers, cruising in a Mustang, traveling down the Pacific Coast Highway… or, just your plain old commute to work. What are your secrets for getting your car extra sparkling clean? Head to our Facebook page and share your tips.